What’s a city to do when a developer wants to construct a building in a historic district that would be taller than allowed by current height limits? If the city is Baltimore and the historic district is Mt. Vernon, the city considers revising its construction guidelines. That’s what the Commission for Historical and Architectural Preservation (CHAP) will be asked to do at its monthly meeting tomorrow. The 13-member panel is being asked to revise its Mt. Vernon New Construction Guidelines by removing a section that prohibits developers from constructing buildings that would exceed the neighborhood’s height limits. Under the proposed change, buildings that exceed the height limits would be “not recommended” by the panel rather than flat-out prohibited. The proposed revision has major implications for one of Baltimore’s premier historic districts. 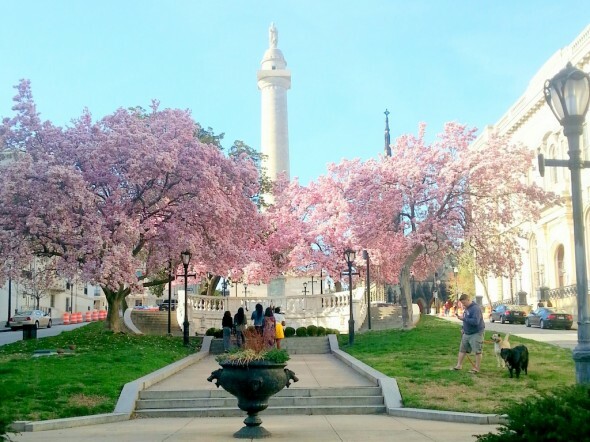 Encompassing about 40 city blocks immediately surrounding and north of the Washington Monument, Mt. Vernon is considered to be so significant architecturally that planners developed a detailed set of design guidelines for new construction there. The proposed change to the guidelines could affect the way planners review proposals for future construction, including how tall buildings can be, and the recommendations they then make to the citizens panel that ultimately decides whether to approve or disapprove a project. The guideline change comes as CHAP grapples with a specific controversial project – the 10-story apartment and retail building that would replace the Eddie’s of Mt. Vernon grocery store and other low-rise structures on West Eager Street. One aspect of the project that has lurked beneath the surface is the potential conflict of interest between the head of the neighborhood organization and the lead developer of the project. In essence, CHAP has been asked to revise its construction guidelines largely at the request of the Mt. Vernon-Belvedere Association, whose president is Michele Richter, the wife of the developer who stands to benefit from the revisions. The commission has given preliminary approval of Dennis Richter’s request to construct a building that would be 116 feet tall, 16 feet higher than the previously-set height limit for the property. But Richter still must come back to the commission to obtain final design approval and provide proof of construction financing before the commission will sign off on a demolition permit for Eddie’s. Mt. Vernon is considered to be so significant architecturally that planners developed a detailed set of design guidelines for new construction there. Any future relaxing of height restrictions could potentially benefit owners of several lots in the historic district. These include parking lots controlled by the Gould family at Charles and Read Streets and Charles and Eager Streets – as well as a large parking lot off Cathedral Street between Eager and Read streets and land next to the Waxter Center on Cathedral Street. It also could prompt other property owners to consider razing low-rise buildings to make way for taller ones, as Richter seeks to do with Eddie’s. 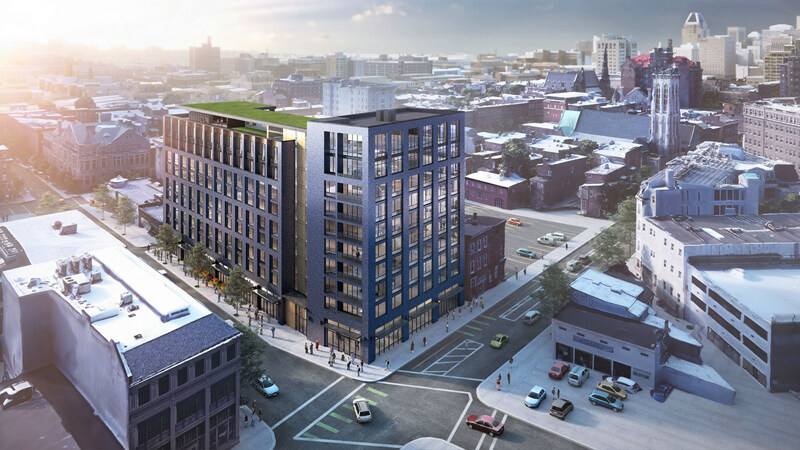 Richter’s proposal to construct a building that exceeds the city’s height limits on Eager Street has raised concerns from some longtime property owners, including a representative of the Agora publishing group. Headed by Bill Bonner, Agora has restored approximately a dozen buildings in Mount Vernon, always working within the shells of existing buildings. One of its buildings, where City Cafe is located, is directly across Eager Street from Richter’s parcel. CHAP’s commissioners said they decided to approve Richter’s request to exceed the Eager Street height limit mostly because the proposal had strong support from the Mt. Vernon-Belvedere Association. The association holds board meetings and other gatherings at 12 West Madison Street, a property controlled by Dennis Richter. Michele Richter has not testified at CHAP meetings about her husband’s proposal, letting other community members speak for the organization. But as president, she has participated in meetings where the Eager Street project and related design review issues have been discussed. 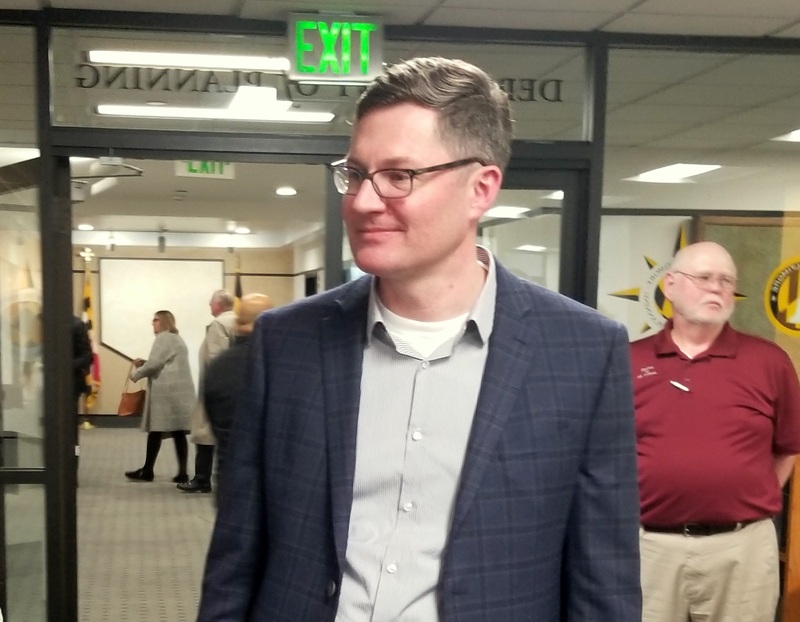 At a MVBA board meeting last month at 12 West Madison, Michele Richter asked a reporter to leave while the board was meeting with two representatives from CHAP, Eric Holcomb and Caitlin Audette. Michele Richter did not give a reason for asking the reporter to leave except to say it was a “private” meeting. Dennis Richter, who sat at the conference table across from his wife, said nothing. The association’s vice president, Wesley Stuckey, escorted the reporter out of Richter’s building. Asked about her potential conflict of interest in the Eager Street development, she said she has been careful to recuse herself from anything to do with her husband’s project. Dennis Richter said today he was looking forward to going to tomorrow’s CHAP meeting and was “happy to have the opportunity to go a little higher” in terms of the replacement building’s height. Tomorrow’s public meeting about revisions to the Mt. Vernon construction guidelines comes two months after CHAP met in closed session with representatives of the city’s law department to discuss the Eager Street project. Last month, CHAP discussed the proposed revisions in a briefing session before its public meeting, but it took no action. One source of concern is that CHAP twice disregarded its own professional staff’s recommendations pertaining to the Eddie’s replacement project and whether that sets a precedent for the future. But the panel voted 9 to 2 to allow the demolition request. In April, the professional staff recommended disapproval of the proposed replacement building on the grounds that the structure would exceed the city’s height limits, which is prohibited under the current construction guidelines. In that case, the panel overruled the staff recommendations and voted 9 to 0 to approve the developer’s proposal. A decade ago, the Mt. Vernon-Belvedere Association requested that the city impose height limits. But the current board believes it would be better if development proposals were considered on a “case by case” basis. At the April meeting, both CHAP staffers and commissioners noted that leaders of the Mt. Vernon-Belvedere Association had requested that the city impose height limits for area properties a decade ago, so community residents and developers alike would know what could be built on any given parcel and the process would not be seen as arbitrary. 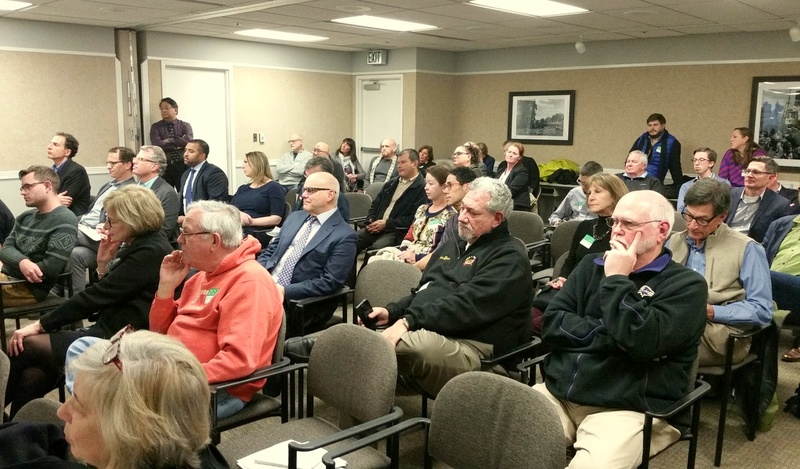 At that meeting, Steve Shen, an MVBA board member and head of its architectural review committee, acknowledged that the organization asked the city to impose height limits in the past. But he said the current board now believes it would be better if development proposals were considered on a “case by case” basis. Holcomb, the executive director of CHAP, said the proposed revisions represent a response to the community’s change in position and essentially involve editing the current construction guidelines to take out one category. Under the current guidelines, he said, the section on height, Section G, lists three possible actions for a development proposal: Recommended, Not Recommended, and Prohibited. “New construction that exceeds the maximum height limits” falls in the Prohibited category. Under the proposed revision, Holcomb said, the “Prohibited” category in Section G would be eliminated. “New construction that exceeds the maximum height limits” would be shifted to the Not Recommended category. The professional staff would still present its recommendation to the citizens panel based on its review of a project, and make an argument for why a design should or shouldn’t be approved. The panel would then vote in public session on whether to accept the staff’s recommendation. Asked whether taking away the Prohibited category means that height limits for Mt. Vernon are effectively abolished, Holcomb said he did not see it that way. He said height limits would continue to exist as part of the construction guidelines and the height limits themselves will not change. “All it does is move things from Prohibited to Not Recommended,” he said. At the same time, the panel always has the prerogative to follow or ignore staff recommendations, as it did with Richter’s project. The meeting on the Mt. Vernon height limits is scheduled to start at 1 p.m. tomorrow (Tuesday) on the eighth floor of the Benton building, 417 East Fayette Street. It will be preceded by a CHAP briefing session at which the proposal likely will be discussed, but the format does not give the public an opportunity to testify.